Usually at 4 PM during work-days, I go out for tea break with my colleagues Prathima and Bharat. We used to discuss or talk about many things. This is totally relaxing in an otherwise hectic working day. During one such tea break, Bharat started asking me about few recipes. First, he asked me whether I know to prepare Morkkali which I knew anyways. He then enquired about Pachama Podi Upma. I blinked and replied "No" to him. With a smile, he replied that his Amma(Mom) prepares this dish at home for breakfast /evening tiffin. As the name and dish were totally new to me, I immediately asked him about the recipe. He called his mom over phone and got the recipe for me. Last weekend, I prepared it as per Bharat mom's instructions. The procedure is as simple as corn flour upma (I am yet to post this) which we usually make at home. 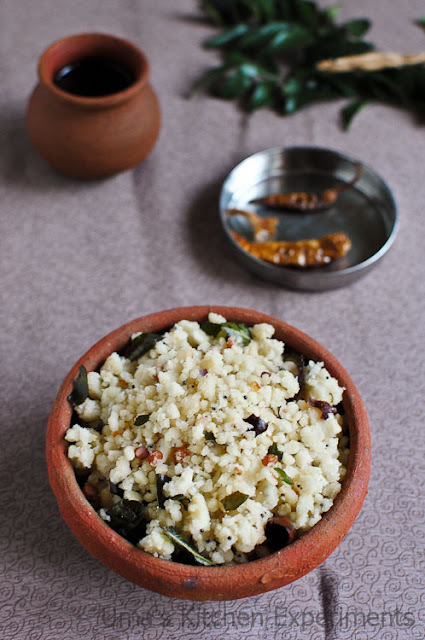 However in this dish we add curd to the flour which we normally don't add while making corn flour upma. I felt happy for knowing yet another traditional breakfast dish and thanks to Bharat for sharing this recipe. 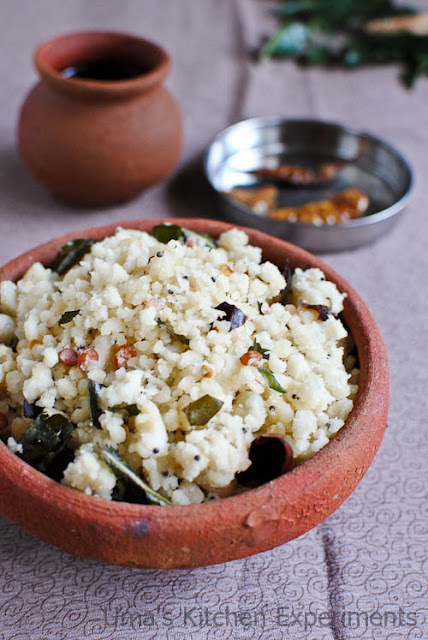 Pachama Podi Upma literally means Pacha Mavu(Raw rice flour) Podi(Crumble) Upma, A upma that is prepared using raw rice flour which gives a small crumble texture as an end result. The upma tasted really good with nice flavor from more/moar (curd) milagai and asafoetida. Point to mention here is that the crust of the upma which forms in the bottom part of the pan tasted very very good, but be careful not to burn it, otherwise you can't enjoy its taste. 1) Take the rice flour in a mixing bowl and add salt. 2) Add yogurt/curd gently to the rice flour and make a dough of it. Keep aside. 3) Heat oil in a pan. When it is hot, add mustard seeds, channa dal, curry leaves, dry red chillies, more milagai and asafoetida. Fry for a 3 seconds without burning anything. 4) Add the prepared dough to the pan. Start stirring it. Adjust the salt if required. 5) Keep on stirring the dough for another 10 minutes. You'll notice that dough will start turning into crumbles. Keep on doing it till the rice flour mixture completely cooked. After some time, it will have soft and crumble texture. 6) Once cooked, transfer it to a serving bowl and enjoy. It won't stick to your fingers once it is properly cooked. 7) Best eaten with more milagai (curd milagai). 1) Reduce the salt quantity if you are using more milagai as this itself has salt in it. 2) Increase or decrease the curd as per your taste. The name itself tempting me..it's similar to mor kali,i think addition of cornflour gives smooth texture.will try it!! sorry i write cornflour,i think we prepared it dough is easiest way....will try this way!! Interesting recipe..sounds simple n tasty! Shall try it soon! This is new to me...sounds delicious. 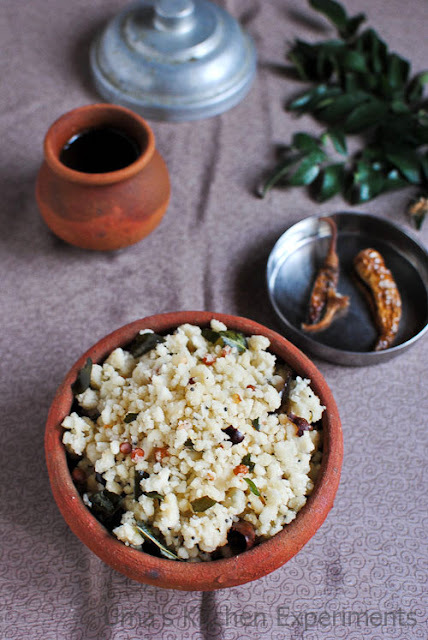 I love this simple upma. This dish is completely new to me.. Thanks for sharing this traditional recipe.. I usually have tried upma out with left over puttu,but haven't tried with scratch..healthy one!! 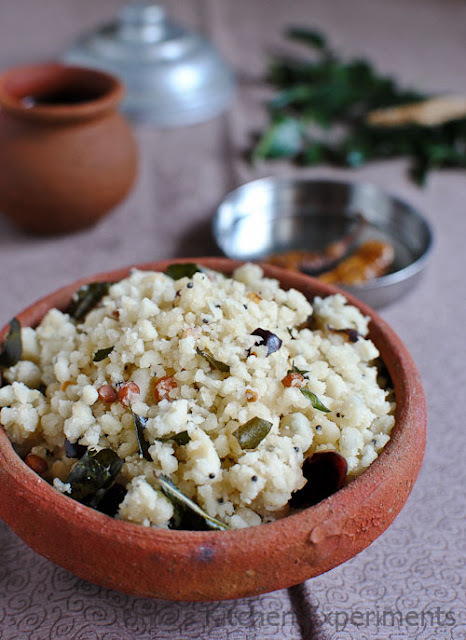 This rice flour upma is too flavorful & delicious. in a similar way i make kali i shd try this uoma so tempting..
you can also make it with tamarind syrup in the place of curd. It will be equally tasty.